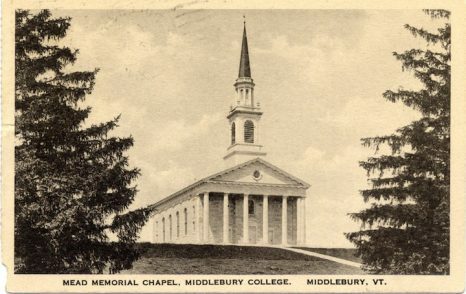 The "new" Mead Chapel (1916) was the gift of ex-governor John A. Mead. The work of Allen and Collens of Boston, it draws freely upon the vocabularies of the American classical styles of the eighteenth and nineteenth centuries in its translation of the traditional New England meeting house into marble. Thus one finds a Greek Revival temple front, Georgian doors and windows and Federal tower. Above the colonnade is inscribed a quotation from Psalm XCV: "The strength of the hills is His also." The tower houses a carillon of eleven bells. Within the building is a beautiful, Georgian-inspired panelled sanctuary with galleries on three sides. The chancel holds the college's Gress-Miles organ, installed in 1971.